The land of origin for Awadhi cuisine is Lucknow, the city of Nawabs and the capital of the state of Uttar Pradesh. The dishes and cooking style of this city is inspired and influenced by the Mughals. The Nawabs of Awadh were used to certain type of diet which includes a variety of grains, dry fruits, vegetables as well as meat. This style of cooking was further polished by the Nawabs by adding exotic flavors of saffron and other Indian spices. Thus the cuisine includes both vegetarian as well as non-vegetarian dishes prepared with exotic spices, herbs and garnished with dry fruits. Basically the Awadhi cuisine marks the beginning of the modern era of Indian cooking. We often mistaken that Mughlai cuisine and Awadhi cuisine are same. But that is not true, Awadhi cuisine has been influenced by Mughlai cooking style. Still both cuisines have some major differences. This cuisine also bears similarities to the cuisines of Hyderabad. The dum style of cooking or the cooking over low heat which has become popular and the signature of Lucknow cuisine was invented by the chefs and cooks of Awadh. The Awadhi cuisine consists of elaborate dishes like kormas, roomali roti, biryanis, kebab, lachha paratha, keema and many more. 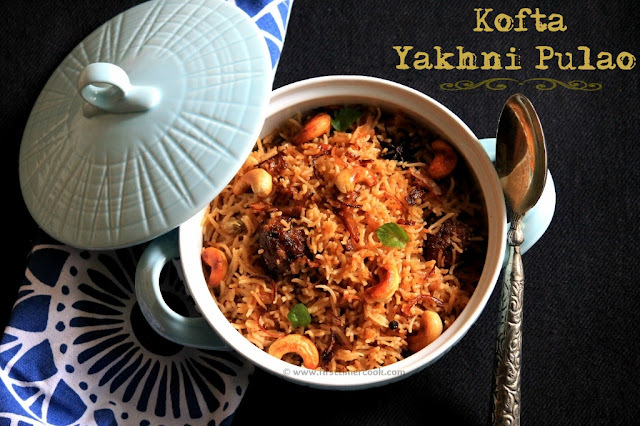 Yakhni pulao is one of the authentic recipe from one of the royal cuisines of India, Awadhi Cuisine. 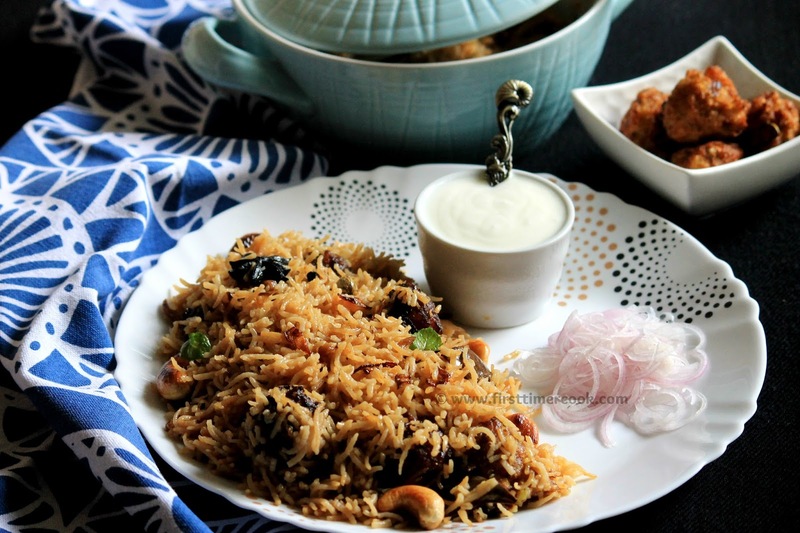 Yakhni pulao is famous in north India as well as other countries like Pakistan, Iran, Afghanistan where yakhni pulao is cooked in different style with many aromatic spices. 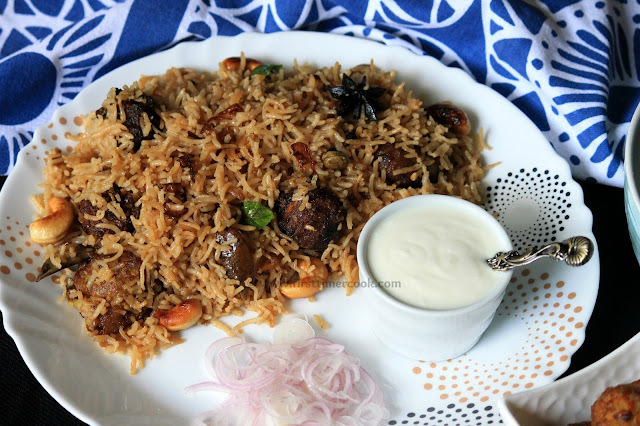 The main difference between a biryani and yakhni pulao is that yakhni pulao is basically made by cooking the meat with aromatic spices in water till the meat is tender, then adding the rice in the meat broth along with meat which is then sealed and cooked over low heat till it is done. But in biryani, the rice is boiled or parboiled separately in spiced water and then layered with meat curry or marinade, depending on the type of biryani being cooked, which is then sealed and cooked over low heat till it's done. Yakhni pulao is not spicy like biryani, but very fragrant and delicious to eat. The term 'yakhni' or 'akhni' is a Turko-Arabic word which means 'savory stock / broth of meat and vegetables with ghee'. Yogurt is the ingredient which is the key to bring all the flavors together and give the yakhni pulao an unique flavor. Now-a-days some variations are being used as the yogurt is replaced by tomatoes, different variety of oil also is used instead of ghee for health conscious. While preparing the yakhni / stock / broth, all the spices are kept inside a muslin cloth or cheese cloth and then the edges of the cloth tie into a knot. This potli is known as bouquet garni and this bouquet garni is simply dropped into the cooking pot to give the pulao an aromatic flavor. 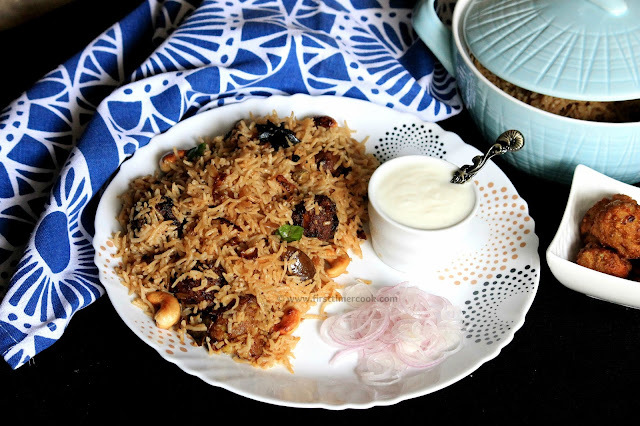 This pulao is often served with a cooling raita. 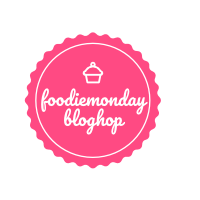 This time the Foodie Monday Blog Hop team have decided a theme as 'Awadhi Cuisine'. So I have opted the yakhni pulao for contribution. This yakhni pulao is a vegetarian version of the authentic one. Instead of simply adding the semi-cooked vegetables which are drained out from the yakhni / stock to cook with rice, some koftas are prepared using them. Here I have used a variety of vegetables to make kofta, but it totally depends upon choice. Some grated paneer can also be used while preparing the koftas. The koftas are deep fried here, but can be shallow fried or cooked in appe pan or can be baked too to reduce the calorie intake. These soft and crispy koftas are then mixed with rice when the rice is about 85-90 % cooked. Whole process is cooked over low heat. 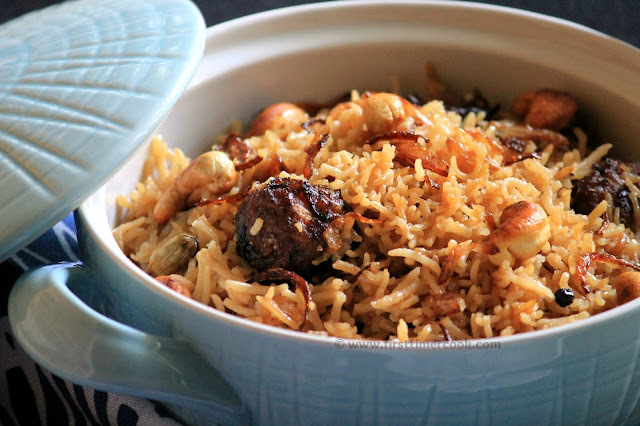 This kofta yakhni pulao is turned out really well and burst with flavorful and rich aromas. Lets go in details. Wash and soak the rice for at least 30 minutes. Place an approximately 10-12 inch size muslin cloth on a plate. Put all the ingredients listed under bouquet garni in the muslin cloth. Gather up the edges and tie tightly with a piece of string, so that all the spices are securely kept inside. Keep aside this bouquet garni. Next in a pan add all the roughly chopped vegetables, ginger, garlic cloves, water, salt along with the bouquet garni. Turn on heat and cook till the vegetables are cooked almost. Then turn off the heat and remove the bouquet garni first. Strain the yakhni / stock / broth through a strainer. Keep aside. In a mixing bowl, take the cooked vegetables (except ginger and garlic cloves) and roughly mash all. Add finely chopped onions, cumin powder, garam masala, coriander powder, finely chopped few coriander leaves, corn flour and salt. Mix everything well. Divide the mixture into equal portions, shape them into lemon sized balls. Deep fry the koftas in hot oil till brown and crisp on all the sides. Drain onto absorbent paper and keep aside. Now heat ghee in a heavy bottom pan. Roast the cashews until golden brown and crisp on medium heat. Drain the roasted cashews and keep aside. Next in the same pan saute bay leaf, green cardamoms, cloves, cinnamon, black cardamom, black peppers till a nice aroma comes out. Add thinly sliced onion and saute till the onions start to change color as browned. Next add the soaked and drained rice and mix well gently. Then add 2 & ¼ cup yakhni or stock or broth, yogurt (whisk very well before adding) and salt. Mix everything gently. Cook on medium heat till the whole mixture comes to a boil. Then simmer, cover the pan and cook for 15 minutes. After 15 minutes add the koftas to the pulao, then again cover and cook for further 5-10 minutes by placing the pan on a hot tawa or frying pan over low heat. Turn off the heat and allow to rest for 5-10 minutes. Transfer this kofta yakhni pulao to a serving platter. Garnish with roasted cashews, some caramelized onions and serve as it is or with simple curd or any raita or curry of choice ! Always cook the koftas over medium to high heat, otherwise the koftas will absorb more oil and will become soggy. If the kofta balls are not getting formed easily from the mixture, then add 1-2 tsp more corn flour to the mixture. After taking 2 & ¼ cup yakhni for pulao, if still some yakhni / stock is left then store in refrigerator and can be used in any soup or curry. 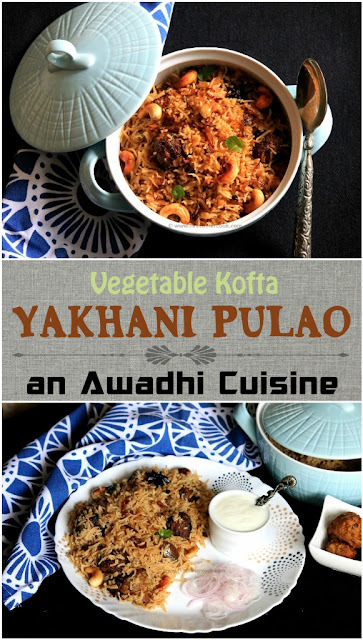 I loved this vegetarian version of the Yakhni Pulao. Bookmarked to try! Wow pulao looks super tempting. I am drooling. Bookmarking to try later. The pulao looks so very good! Inviting! This pulao looks so so tempting. I came across a yakhni pulao recipe but it used jackfruit so I decided on a paneer dish. This recipe is bookmarked to prepare for a dinner I will be hosting soon. Indeed one of the best share... Loved it! Delicious Pulao. My kids favorite rice dish and these are inviting! Wow.... Pulao looks very inviting. I'll surly try this recipe. Looks incredibly delicious! I've never had the vegetarian version - so keen to try this! This looks do delicious! Thank you for sharing this. Would love to try this! I love vegetarian Kofta and that rice looks incredible. Thanks for the historical info too, really interesting. I have never tried awadhi cuisine, this pulao looks interesting. Love this vegetarian version Samita.Superb share ! !